Sports agent Bartolo Hernandez and baseball trainer Julio Estrada could learn their fates early this week. The defense rested on Friday without either Florida man taking the stand to refute criminal charges that they conspired with human smugglers to transport baseball players out of Cuba for a cut of lucrative free-agent contracts with Major League Baseball teams. Closing arguments are set to begin Tuesday morning in a Miami, Fla. federal trial that has gone for six weeks, highlighted by mind-blowing testimony from some of the best Cuban big leaguers about their harrowing journeys from the communist nation to foreign countries before emigrating to the U.S. The jury could start deliberations Tuesday afternoon. Federal prosecutors allege Hernandez and Estrada were identifying peloteros for an organized crime ring operating in Florida, the Caribbean and Mexico, as well as financing smuggling fees, living expenses and forged travel documents for the players. As the case winds down, testimony and evidence presented to the jury shows how the black market for Cuban players flourished thanks to MLB and the U.S. embargo against Cuba that prevents American companies and individuals from doing business on the island. 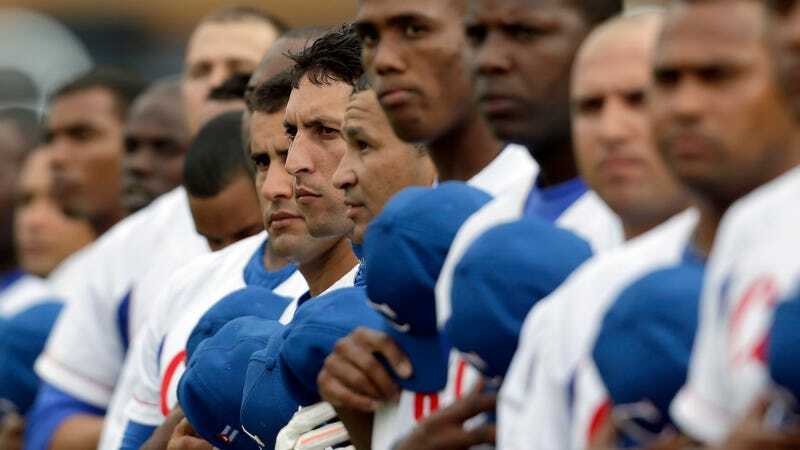 As a result, Cuban players must defect to sign with teams. Under current MLB rules, a Cuban player who enters the U.S. directly would have to enter the league’s amateur draft, possibly losing out on millions of dollars. But they can qualify for free agency in a roundabout way because MLB allows peloteros to sign with teams if they can prove they were temporarily living in another country after defecting from Cuba. Prosecutors accuse Hernandez and Estrada of being part of a conspiracy that charged players a 25 percent cut of their multi-million dollar contracts—far above the standard five percent vig sports agents normally charge—for their help in making this happen. Sports agents who collaborated with Hernandez and Estrada, team executives, and even U.S. immigration and State Department officials weren’t exactly verifying that the players had legit papers and were telling the truth when they crossed the border, according to witnesses and evidence presented by the defense team. Scott Shapiro, a lawyer whose agency Praver Shapiro Sports Management has worked with Hernandez since 2009, testified on March 8 that he was responsible for preparing the applications for the players’ U.S. visas and licenses from the Treasury Department Office of Foreign Assets Control, or OFAC. Shapiro said he had no reason to suspect players’ foreign residency documents were fake or contained false information, but that he would only receive scanned or faxed copies. “No, I would not have,” Shapiro replied when asked by Hernandez defense lawyer Daniel Rashbaum if he would have still submitted the documents if he knew the papers were forged. Furthermore, Shapiro testified, OFAC and State Department bureaucrats never raised any red flags. He denied knowing that some of his clients falsely claimed to holding jobs as auto mechanics and welders on their Mexican residency papers. Under cross examination, Shapiro said he never asked Hernandez about specific details of how he had access to so many Cuban baseball players during the eight years they worked together. “Not particularly, no,” Shapiro said. He also denied having any knowledge about who the smugglers working with Hernandez and Estrada were and about some of the players who crossed the U.S. border illegally. For instance, Shapiro said he was caught by surprise when he found out Leonys Martín crossed the border without a valid visa on April 2, 2011, the same day his agency partner Harry Praver received a letter of agreement from the Texas Rangers for the Cuban center fielder. Martín subsequently signed a $15.5 million contract with the team, but he was traded to the Seattle Mariners in 2015. As it turned out, there was nothing to worry about. “Major League Baseball chose not to penalize Mr. Martin for the way he entered the country,” Shapiro said.